Planner based in West Malling since August 2018, Irianna gained a BSc (Hons) in Architecture, followed by an MSc in Town Planning from Anglia Ruskin University. Her architectural background and work experience both in England and abroad, have given her valuable skills. 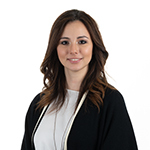 Before joining Tetlow King Planning, Irianna was employed at Hobbs Parker Property Consultants as a Graduate Planner. Her work experience includes the preparation and submission of applications and appeals in a variety of fields, ranging from agricultural diversification to residential development. Her responsibilities included removal of conditions, new build residential applications, development in designated areas and a successful appeal for one of the sites included in the Wye College Masterplan. Highly skilled in producing evidence to support complex proposals, Irianna is now involved in a range of small and large-scale development schemes.